The Victorian Dermal Group is a boutique skin treatment clinic, specialising in highly effective non-surgical cosmetic solutions. The Victorian Dermal Group had tasted success with their marketing spend, however more recently their enquiry rate had plateaued. In order to consistently grow their business, they needed a plan of action to significantly increase their website conversions. It was also very important that their existing stream of enquiries was not interrupted. Our aim was simple: to first optimise the pages that were leaking the most revenue. Our analysts were focused on finding out what’s causing those big leaks and getting into the head of the customer by learning what they love and hate. On discovering these various customer emotions, interests and frustrations via our data/behaviour gathering tools, we were able to propose new changes that we could test – some included more compelling benefits, adding more urgency-focused colours, modifying the page layout and including much sought-after value. 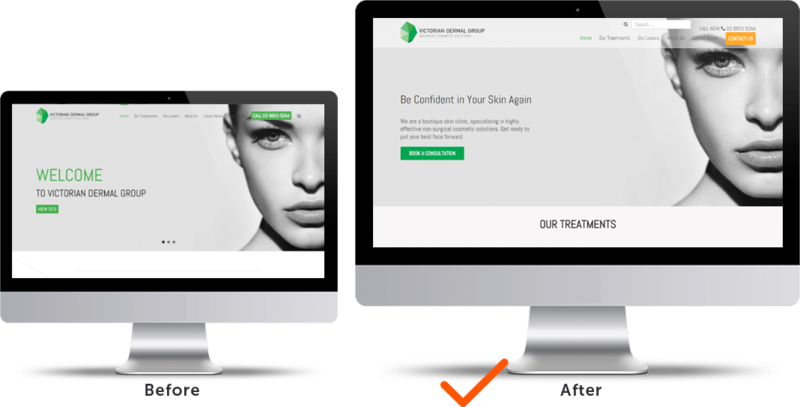 On A/B testing these select pages, we saw an immediate increase in the quality and number of enquries – achieving a 33% increase in Web Form Enquiries and 250% increase in Phone calls. The Victorian Dermal Group team were thrilled with the result – and they requested Conversionry to conduct ongoing monthly AB testing to bring in a monthly increase over and above their previous result. Our ongoing monthly CRO program has since been achieving for them record month-on-month increases in conversion rates, bringing in the highest ROI they have seen for their marketing spend. 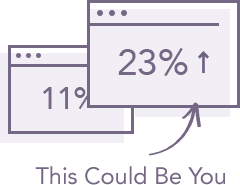 A 33% increase in Web Form Enquiries and 250% increase in Phone calls.